Elk hunting is a serious business, a big bull can weigh up to 800 pounds and be up to five feet tall at their shoulder. Elk hunters have to plan how they will field dress their kill and transport it. This is where a great lodge or ranch comes in. Take all the worry and stress out of a hunting trip and add in some luxury. You may want to use a property’s experienced guides and meat processing and taxidermy services. On the other hand, you may just want a place to come back to after a long day of hunting and relax in a comfortable room with top-notch amenities. You can hunt elk anywhere from the Rocky Mountains of Colorado, to the Teton Wilderness region of Wyoming, to the Uinta National Forest of Utah. Wherever you choose to go, make sure you pick the accommodation that fits you best. Branded Rock Canyon, a private ranch retreat in De Beque, Colorado, is the perfect place for your next elk hunting trip. At Branded Rock Canyon, make sure to take part in the big game hunting, which includes Rocky Mountain elk and mule deer, black bear, and mountain lions. The ranch is conservatively managed for the highest quality trophies and one-on-one guided experiences. Branded Rock’s big game hunts are by invitation only. They also offer incredibly unique precision shooting and hunting schools during the months of March through August. Shooters who participate in the schools are coached by the most experienced instructors in the industry and presented with real-world hunting and shooting scenarios, angles, and obstacles on life-sized steel wildlife and moving targets. Branded Rock is one of the premier recreation ranches in the world, featuring real situation hunter training on their multiple shooting ranges. Branded Rock Canyon will make sure you are skilled before you get in the ring with big game. The ranch not only has an on-site international hunting concierge service, but also offers luxury accommodations, superb cuisine, and good old-fashioned Western hospitality. The Homestead Lodge and Guesthouse feature 15 private guest rooms with beautiful mountain vistas, five-star amenities, and handmade wood furnishings. Stay at Branded Rock Canyon for comfortable accommodations nestled in the rugged Colorado landscape, as well as an unforgettable elk hunting experience. Make sure to take advantage of all that Branded Rock and De Beque have to offer. Enjoy exquisite wines and spirits and spa therapy at Branded Rock, as well as local tours in De Beque. The ranch is located approximately four hours from Denver and two hours from Aspen and Vail ski resorts. The award-winning Lodge at Chama in Chama, New Mexico is legendary for its big game hunting, trout fishing, and luxurious accommodations. Lodge at Chama, owned by the Jicarilla Apache Nation, offers some of the most sublime sporting opportunities and scenery in North America. At the lodge, guests can experience the gold standard of big game hunting and hunt some of the grandest bull elk in the world. You and your group can participate in a private herd hunt and explore over 6,000 acres of high valleys, ridges, peaks, and canyons. You can also do a general ranch hunt and hunt nearly 30,000 acres for migratory elk that make Lodge at Chama their home. Along with their world-renowned hunting, the lodge has extraordinary rooms and suites, high-quality cuisine, and elegant corporate facilities. Lodge at Chama is the perfect place to experience the outdoors at their finest. The elevation of Chama, New Mexico is 7,871 feet. The mountain range of Chama, New Mexico are the Rocky Mountains. Nestled in the mountains of Southeast Idaho sits Rocky Mountain Elk Ranch, a premier hunting ranch and lodge. Rocky Mountain Elk Ranch offers an amazing 100 percent guaranteed, fully guided, three-day trophy elk hunt in the Big Hole Mountains of Southeast Idaho. Despite the fact that the ranch guarantees the success of your elk hunt, it is fully tailored to be as challenging as you desire. Hunters can select their weapon of choice, including a rifle, archery, crossbow, and more. Rocky Mountain Elk Ranch can accommodate hunters of all skill levels and physical abilities. They also offer group discounts for three or more hunters and for hunters under 18 years old. Stay in their luxurious handcrafted lodge while hunting trophy bull elk and enjoy spectacular views, both inside and out. Unwind after a day of elk hunting by watching the sunset on their wrap-around deck, catching a movie on the satellite television provided, or soaking in the Green Canyon Hot Springs at the bottom of the hill. There are many activities besides hunting in the surrounding area, including hiking, white-water river rafting, mountain biking, and more. Come to the Rocky Mountain Elk Ranch to escape everyday life and experience the elk hunting trip of a lifetime! Make sure to explore the beauty of Idaho while at the lodge. Jump on a four-wheeler and explore the St. Anthony Sand Dunes, appreciate the beauty of Mesa Falls, or do some fly fishing in Henry's Lake. Rocky Mountain Elk Lodge offers three fantastic meals a day that will make your hunting experience a true retreat. Don’t worry about hauling in food and numerous supplies, leave the cooking to them! Triangle X Ranch, with its historic accommodations and world-class hunting, is the perfect place for your next Dude Ranch vacation destination. Triangle X Ranch operates three hunting camps in the Teton Wilderness region of Jackson Hole, Wyoming, directly south of Yellowstone National Park. Their camps offer some of the finest big game hunting in America and their region has unsurpassed opportunities for trophy elk. The location of the hunting camps gives Triangle a near monopoly on one of the finest and largest hunting areas in the state of Wyoming. The Teton Wilderness, along with the Yellowstone National Park, summers the bulk of the Jackson Hole Elk Herd. Triangle’s hunting camps are located on the main migration routes the elk take from Yellowstone to the National Elk Refuge. The area produces some of the largest trophies taken each year in Wyoming and often records the highest harvest percentage for elk in the state. Triangle X Ranch guests can come back after a long day of hunting and stay in one of their 20 distinct log cabins. Each cabin has had their historic character preserved, while still being well maintained and comfortable. Their cozy cabins range from one to four bedrooms and are equipped with quality amenities such as a private bathroom, small refrigerator, and a porch with breathtaking views. Enjoy the simple pleasures and connect with unspoiled nature while staying at Triangle X Ranch. Five generations of the Turner family have welcomed guests into their home in Grand Teton National Park since 1926. With over 50 years of Snake River experience Triangle X and National Park Float Trips provide quality river trips including, scenic raft trips and guided fishing trips to visitors- entirely in Grand Teton National Park. Make the most of your next hunt and skip freezing in a tent with a stay at Strawberry Bay and Lodge in Herber City, Utah. Nestled high in the Uinta National Forest of the Wasatch Mountains of Utah, Strawberry Bay and Lodge combines convenience and year-round accessibility with the best of outdoor adventure and recreation. Strawberry Bay is perfectly situated in the middle of prime Royal elk hunting country, but other wildlife include black bears, cougars, mule deer, and many more. If you are looking for the hunting experience of a lifetime, Strawberry Bay’s outfitters specialize in guiding in the Wasatch Unit. This unit has more elk than any other unit in Utah and has produced several of the top record elk in the state. Strawberry Bay guests can stay on right on the Strawberry Reservoir and avoid wasting precious fishing time. They have a variety of comfortable rooms in different sizes and types to fit anyone’s needs, from a room with a single full-size bed to a five queen bed suite. When hunters come back from a long day, they can relax with a wonderful view of the Strawberry Reservoir and enjoy a delicious meal at the Strawberry Bay Café. There is also plenty to do for non-hunters during every season, including boating, fishing, and hunting. Escape with your friends and family to Strawberry Bay to experience the best Blue Ribbon fishing, hiking, hunting, and snowmobiling that Utah has to offer. Attention golf-lovers! Make sure to check out the Herber Valley Annual Golf Tournament. The proceeds from the tournament go back into the community and there are awesome prizes available! The Wasatch Unit has produced several of the top record elk in the state including the 2006 muzzleloader world record, taken just 10 miles from the Lodge. Caryonah Hunting Lodge, located in Crossville, Tennessee, is not only known for their luxurious lodging and exemplary customer service but their world-class hunting as well. At Caryonah Hunting Lodge, they are especially known for their Russian wild boar hunting, as well as other exotic species, including Corsican and Texas Dall rams, buffalo, and elk. 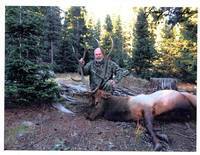 Anyone, including families and solo hunters, looking to capture the majesty of the outdoors can enjoy an elk hunt. If hunters are successful in their hunt, their kill is field dressed and hauled by their professional guide and brought from the woods to Caryonah’s walk-in cooler. Meat processing and taxidermy service is available at an additional fee. Upon returning from a hunt with one of Caryonah’s experienced guides, guests can enjoy a Tennessee home-cooked meal at the high-beamed Hunter’s Hall, and then kick up their feet by the rustic fireplace and swap hunting tales. After a long day of trekking through the Tennessee mountains, hunters can come back and enjoy the indulgent comfort of Caryonah’s cozy lodge. Each room is newly remodeled and fully-equipped with an array of amenities including 450-thread count linens, central heat/air conditioning, and en-suite bathrooms with Italian-tiled showers. Caryonah Hunting Lodge has all the comforts of home while being surrounded by the breathtaking Cumberland Plateau, making it the best way to experience the natural beauty of Tennessee. Caryonah guests who may not be interested in hunting can fish at any of the private lakes, filled with Bluegill and Bass, or golf at one of the 10 world-class courses in the area. Caryonah Hunting Lodge is the oldest and largest family-owned hunting lodge in the Southeast.